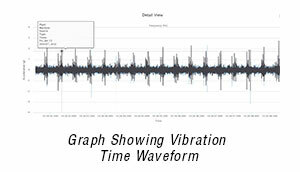 Although a number of sophisticated techniques can be used, the two most fundamental methods for presenting vibration data are the time waveform (amplitude as a function of time) and the frequency spectrum (amplitude as a function of frequency). Based on the features of a system, it is possible to model its vibration spectrum. For a given rotating asset, this would include an expected peak at the fundamental rotational frequency of the shaft, synchronous peaks (harmonics) based on additional components like fan blades and gears, etc. In particular, electronic tools can be used to very effectively model expected system behavior. In order to effectively use vibration data for condition monitoring, it is important to establish a baseline. After all, not all vibration is sinister. There are many vibrations that are benign in nature and have no impact on the lifetime or performance of machinery. A baseline vibration spectrum makes it possible to identify these features. 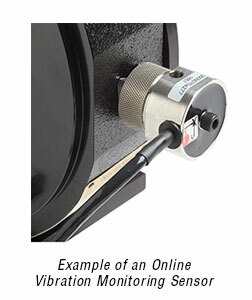 Vibration data is captured by accelerometers installed on one or more orthogonal axes. The sampling rate of the accelerometers needs to be fast enough to capture the behavior of interest. Next, the signal needs to be digitized at an appropriate sampling rate to enable it to be digitally reconstructed. The result is the time waveform (oscillation amplitude as a function of time) of vibration along the axes of interest. The next step is to perform a fast-Fourier transform (FFT) algorithm to convert the time waveform into a vibration frequency spectrum. The scope of the frequency spectrum depends upon the accelerometers and the analog-to-digital converter (ADC) used. As discussed above, much of the insight delivered by vibration analysis is based upon correlating frequency spikes to physical characteristics of the system. The correlation process starts with looking at so-called synchronous peaks - peaks that are harmonics of the fundamental rotational frequency of the shaft. Consider an 1800 RPM, 3 Hz motor that is driven by a 480 V, 60 Hz electrical input. The fundamental frequency would be 30 Hz. Any synchronous beats - peaks at 2X, 3X, 4X, etc. - provide insights about issues directly related to the rotation of the motor shaft. Consider a six-vane pump. A pump with six vanes, for example, will have a vibration spike at 6X, or six times the fundamental frequency. If that peak triples or quadruples, it indicates some sort of problem with the vanes. Time-waveform analysis can enhance vibration analysis. It should not be considered a primary tool but rather as a tool to provide additional insights. It can be useful for low-speed applications because it reveals the way the machine is moving. Time-waveform analysis is frequently used for analyzing gears, for example. There is a crossover point at around 100 RPM – below that speed, time-waveform analysis provides better results and frequency analysis is not effective. The other tool that complements frequency and time-waveform analysis is phase analysis. This is an analysis of the heavy spot of the analysis in relation to some trigger. This might be vibration introduced by anything that correlates with the shaft rotation frequency, such as a bearing defect. Phase analysis makes it possible to determine where the shaft vibration occurs in relation to the shaft. In rotating equipment, the vibration spectrum will feature a spike at the fundamental rotation frequency of the shaft. This is true for any system, not just one with flaws. The system typically will also display spikes at multiples of the fundamental frequency, referred to as 2X, 3X, etc. These are known as synchronous peaks. They are frequently tied to physical characteristics of the system. A gear with 32 teeth will introduce a vibration spike at 32X, or 32 times the fundamental frequency, for example. Not all features in a vibration spectrum are synchronous. The system may suffer periodic shocks or impacts that will generate spikes. Asynchronous frequency spikes also can be generated by features like a gearbox with multiple stages, a pump suffering from cavitation, etc. These asynchronous peaks can provide useful diagnostic information. 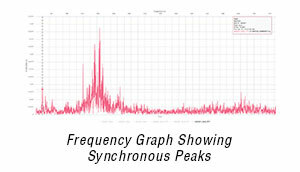 Vibration spectra can exhibit a third type of feature known as sub synchronous peaks. These are basically harmonics of the fundamental frequency. They are caused by any physical element of the system that operates at a frequency below that of the main shaft. A loose belt on an axis rotating at 30 Hz, for example, might slip enough to move at just 29.19 Hz. This will create a frequency spike immediately next to the fundamental spike at 30 Hz. Other examples include cage defects in ball bearings, turbulence, etc. The tools and methods described above can be applied to quantitatively assess the condition and performance of equipment. 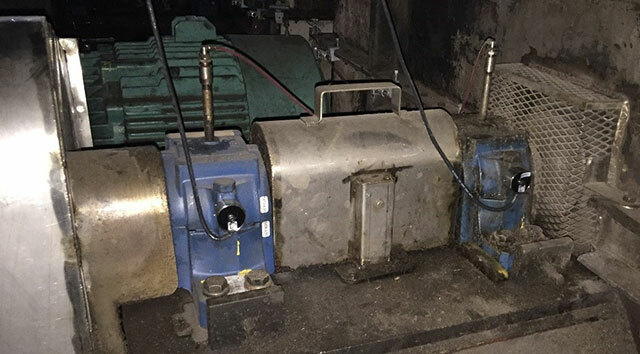 Vibration data can reveal when equipment has broken welds or bolts, whether the rotor bars in a motor are intact, if the air gap between rotor and stator in the motor is non-concentric, etc. Vibration data can alert maintenance teams to structural or rotating looseness or the presence of resonance. Vibration analysis can be used to determine whether bearings have been properly installed. In a taper bearing, for example, the inner race has to be expanded to take up the clearance between the rotating element and the outer race. If that clearance is not removed, the bearing may wind up crooked or wobbling. This will introduce non-periodic features into the vibration signal. Phase analysis also can be used to check bearing concentricity. Vibration analysis also can be used to determine how well a machine is assembled. It can detect misalignment in a pump, for example, determining whether the rotating elements are binding, if the base is uneven, or if torsion exists between motor and pump. Vibration monitoring starts with critical assets, expensive equipment that would a represent substantial loss in the event of catastrophic failure. 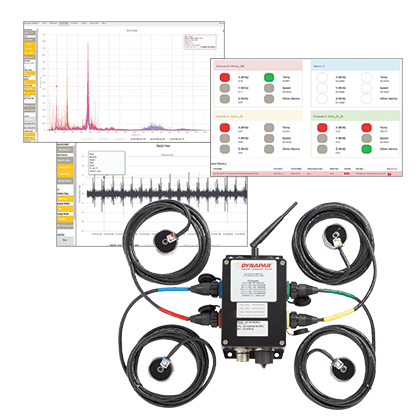 Historically, this type of equipment has been tracked using route-based vibration monitoring and, eventually, continuous online condition monitoring. Anomalies in the vibration spectrum can indicate issues such as lubrication breakdown and bearing defects sufficiently far in advance to permit timely repair, prolonging the lifetime of the asset. Many plants operate around the clock, stopping once a month or once a quarter for scheduled maintenance. Unscheduled downtime reduces productivity and can cost from tens of thousands of dollars per hour to tens of thousands of dollars per minute. Online vibration monitoring provides a method for monitoring a troubled asset during the run-up to planned maintenance. If the condition of the equipment worsens, the line can be stopped before catastrophic failure occurs. With continuous online vibration monitoring, maintenance teams can receive immediate alerts when the condition of a troubled asset changes, enabling rapid response. When it comes to maintenance, the most challenging assets are not necessarily the high-value ones but those located in hard-to-reach locations such as on rooftops, inside inaccessible cooling towers, high radiation or high-temperature environments, etc. Vibration monitoring makes it possible to understand how the various components of the system are working. Maintenance can detect problems early and take action when it is convenient to forestall unplanned downtime without putting personnel at risk unnecessarily. In today's industrial environment, management, maintenance, and OEMs seek every tool possible to maximize availability. Online vibration monitoring is an essential tool for predictive maintenance (PdM), enabling asset owners to maximize productivity and minimize downtime while increasing worker safety. With economical online condition monitoring systems, organizations can take advantage of the benefits of online condition monitoring at a user-friendly price.